has got something Nancy and if you could give him a part time job to let him keep painting that would be great. Kevin and I got on great for years. He worked in the shop and sold his own paintings and prints there too. The painting was as George had suspected a great success. 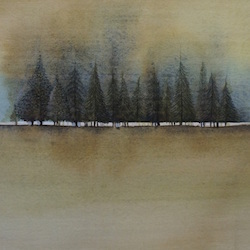 Kevin's atmospheric and sensitive work sold well. I like to think his experience of working in the shop gave him an insight into the possibilities of working for himself. Then, one day he announced he was going out on his own. It was great news! Contemporary Online Art Gallery & Gift Shop. Featuring Scottish Art, Crafts, Jewellery, Paintings, Prints and Photography. For Sale and Commission Online In Scotland. Selected and curated by Professional Scottish Landscape Artist Kevin Hunter. Born 1952 in Nairobi, Kenya, Ernesto Floriano Vaz came to the UK in 1972, a refugee of Idi Amin’s Ugandan regime. Trained at the Glasgow School of Art. To view Ernesto's portfolio and purchase any paintings or prints, please visit his shop section on this link.